Kidney vetch is a European perennial plant; the procumbent or erect stem grows from a strong taproot to a length of 8-16 inches. The basal leaves are petioled and simple or pinnate; the stem leaves are odd-pinnate, the leaflets lanceolate with the odd leaflet larger than the others. The yellow flowers are arranged in ovoid or subglobose, clover-like heads, appearing from May to September. Another variety: The Chinese use a plant they call vetch (Vicia hirsuta), the Chinese name is Ch’iao-yao. Recommended for chronic malarial difficulties. Found in limestone soils, dry meadows, hills, and railroad embankments. A warm infusion of kidney vetch can be used to wash wounds, which are then covered with a poultice which is renewed every hour. The tea is often given to children as a mild purgative, and it sometimes helps to allay vomiting in children. 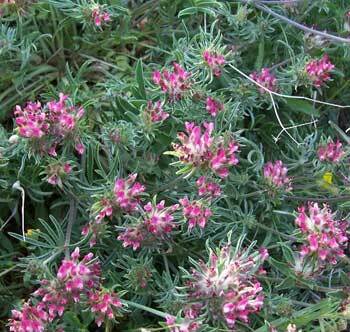 Kidney vetch can be used fresh or dried. Infusion: steep 1 tsp. flower heads in 1/2 cup water. Take 1 cup per day, sweetened with honey.